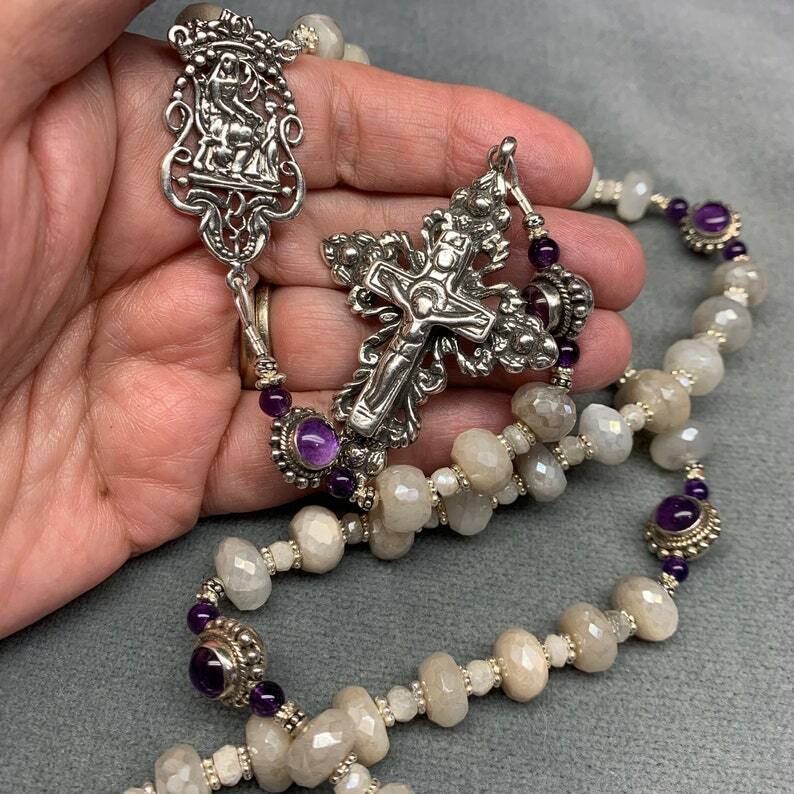 This exceptional Heirloom Rosary, with its timeless and elegant greyed Silverite and handmade Bali beads in Sterling and Amethyst is a stunning and one-of-a-kind Rosary. 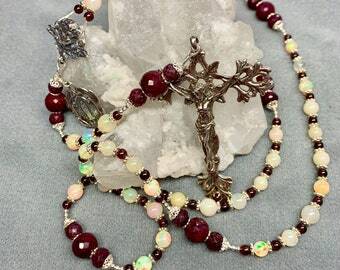 It is, like all our Rosaries and Sacramentals, designed and made by hand in out small, 2 person workshop here in the Midwest US. The Sterling Silver Crucifix is a hand cast reproduction of an antique Russian double-thick Cross, substantial and sturdy. The center, also cast from the antique original, shows the child Mary at the feet of St Anne. There is a small Immaculate Heart and Sacred Heart on the back. Genuine Silverite (actual mineral name Sillimanite) is an increasingly popular stone in the same family as Kyanite, and like Kyanite, has a somewhat . chatoyant appearance (translation -- highlights and/or generalized glow that changes from different angles). 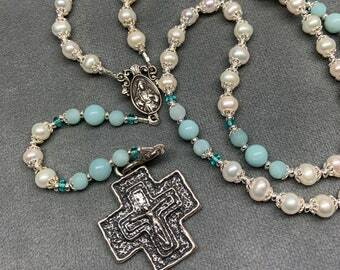 It is not particularly expensive and is semi-precious, not precious, which makes it a beautiful and affordable Rosary bead. 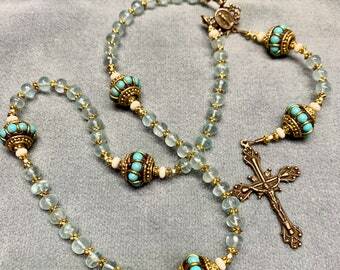 With the 6x9mm Our Fathers and weighty Silver, this is a more substantial Rosary than the traditional 6mm versions. 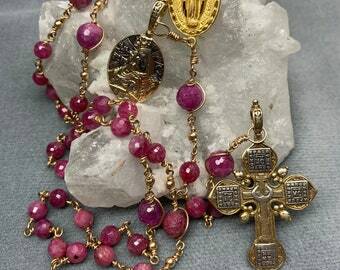 It is not a pocket Rosary, but will happily live in a purse, or on a table --or at your bedside, where the differences in shape and size of the Our Fathers make it easy to know you're at the end of a decade without looking. It is approx 20" long. As always, this Rosary will arrive ready for presentation, boxed in purple and in a beaded velvet and organza gift bag.